The Parsons’ Cause was a legal conflict rooted in the volatility of the tobacco-based economy and the state-sponsored Church of England. The Anglican Church in Virginia was funded through public revenues, and like other public officials, clergymen were paid their annual salaries in tobacco. When severe droughts and poor crop returns caused significant shortages, the value of tobacco fluctuated drastically, rising from the decades long price of two cents per pound to as much as six cents. In response, the legislature passed the Two-Penny Act in 1758, which set the value of contracts payable in tobacco at the normal market price rather than the recently inflated price. The clergy were to be paid at a rate of two pennies per pound. The clergy, whose salaries were reduced, appealed to authorities in England, who overturned the law and encouraged ministers to sue for back pay. In Hanover County, the Rev. James Maury sued his parish vestry and won. In December 1763, a young attorney named Patrick Henry argued the sentencing phase of the case on behalf of the vestry. Henry delivered an impassioned speech in which he criticized the clergy and what he perceived as an overreach of British authority. Henry argued “that a King by annulling or disallowing acts of so salutary a nature, from being Father of his people degenerated into a Tyrant, and forfeits all right to his subjects’ obedience.” Henry persuaded the jury to award Maury a minimal compensation of just one penny. Henry’s role in the Parsons’ Cause enhanced his image as a lawyer and launched his political career. His defense of the Hanover vestry demonstrated the beginning of opposition to British authority in the internal affairs of the colonies. The Parsons’ Cause was the first in a series of protests directed toward the Crown in the 1760s and 1770s. The case also revealed a growing dissatisfaction with the established church in Virginia. 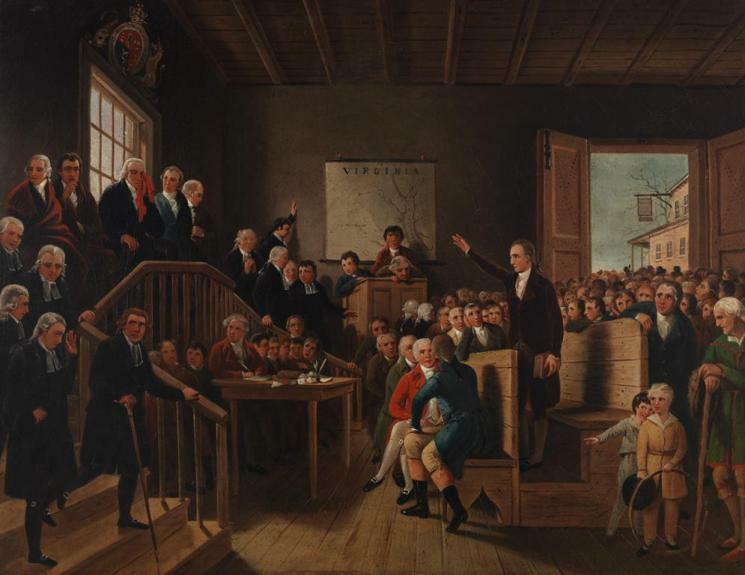 Patrick Henry Arguing the Parsons’ Cause at Hanover Courthouse was painted around 1834 by George Cooke, a renowned mid-nineteenth-century artist of portraits, southern landscapes, and historical scenes. This oil painting depicts Patrick Henry delivering his oration in defense of the Hanover County vestry on December 1, 1763. It was acquired by Victor Spark of New York from John Schwarz of Baltimore, who bought it from the estate of Elizabeth Lloyd Lowndes of Cumberland, Maryland. Learn how Mary-Cooke Branch Munford helped improve education in Virginia. Learn about the beginning of Black History Month.